Amanda received an Honours BSc in Neuroscience from the University of Lethbridge and moved to Medicine Hat in 2017. 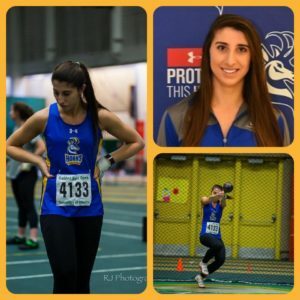 She trained and competed for the U of L Pronghorns track and field team as a hammer and weight thrower for five years. She is a five-time Canada West Championships competitor and five-time Academic All-Canadian Award recipient. As a Pronghorn athlete, she was a volunteer coach at various schools and club programs in Lethbridge and surrounding area. In her spare time, Amanda enjoys hiking and spending time in the mountains. She is very passionate about health and fitness and is excited to share this passion with the Panthers Track and Field club.